To define knowledge is to say that it is information and skills acquired through experience and education. To gain knowledge, one needs access to information. In business, knowledge is an asset that permits a firm to gain a competitive advantage. Examined and conceptualized as declarative, knowledge is facts or as procedural, knowledge is knowing how to perform a job. The modern CFO must possess the skills, the knowledge and the information for success on the job in an increasingly complex and competitive business environment. All the skills in the world are not enough if outdated financial and accounting software limit knowledge, and the ability to get continuously updated information in real-time from anywhere is non-existent. Intacct’s white-paper, Buyer’s Guide to Accounting and Financial Software is a comprehensive resource for analyzing the best available accounting and financial software programs and for finding an experienced and expert service provider. It answers most questions that a CFO will have regarding the best choice for their company. Other questions and answers follow. What is exceptional financial information? The scope of a Financial Management System is greater and more profound than the technical operations of accounting software. Accounting professionals get immersed daily in internet technology. It comes to them at all levels and in all areas of accounting. E-commerce platforms, XBRL, and ERP systems get delivered online. Hot topics in accounting technology include accounting and business intelligence updates, mobile apps for the iPhone and iPad and cloud computing. Cloud computing allows companies to manage and store information remotely. Firms can access customized software, services, and information through the internet on any device. Cloud computing has transformed accounting, increased collaboration and efficiency, and reduced costs for businesses. The accounting profession has moved to the internet age and what they get from it is exceptional financial information. How is outstanding financial data created and delivered? Knowing the options is critical for any intelligent decision-making process. While the options for the delivery and types of accounting software vary, they do not offer the same results. On-premise solutions may work for vast corporations. However, these systems are expensive to buy, operate and maintain. A hosted solution is another option. While less expensive to run and maintain than the on-premise model, they are still expensive. The company does not have to maintain the hardware which lessens the capital outlay, but there are extra costs associated with customizations, upgrades, integration and support and service. The cloud-based model offers real outstanding financial information. Cloud-based applications provide always-on access through a per user/ per month subscription basis with no upfront fees, capital investments, or long-term commitments. There is no license to buy, and no hardware, software or networking infrastructure to maintain. Better service plus less cost equals outstanding financial information. Is the cloud the best choice for my financial management needs? Is there a need to access the system from outside the office? If yes, the cloud-based financial management system is securely accessible anytime, anywhere, and from any internet ready device. Is there a need to accelerate financial processes? If yes, cloud-based systems are live, real-time, and they significantly accelerate crucial financial processes without increasing employee headcount or IT budgets. Does my financial management system need to integrate with other applications? If yes, integration with applications is efficient in the cloud. You can choose the best applications for each functional area of your business with no costly programming and maintenance expense. Do stakeholders across the firm need access to the financial system? If yes, cloud-based financial management systems provide real-time dashboards for the management team. Also provided are key performance indicators for each department and each budget. One can build trusted relationship by offering lenders, auditors, CPA’s and members of the board access to what they need to know. All stakeholders benefit from cloud-based financial management systems. Intacct’s white paper, Buyers Guide to Accounting and Financial Software deep dives into the benefits of switching to a cloud-based financial management system. Not only does it provide answers to all questions that you may have but it also offers comprehensive guidance on the steps to take to find an exceptional, outstanding cloud-based software provider. 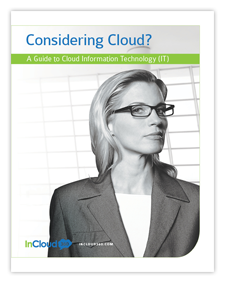 Contact InCloud360 today to download the white paper and become an informed buyer. Do not make your company an also-ran when it is a true winner with a modern cloud-based solution.